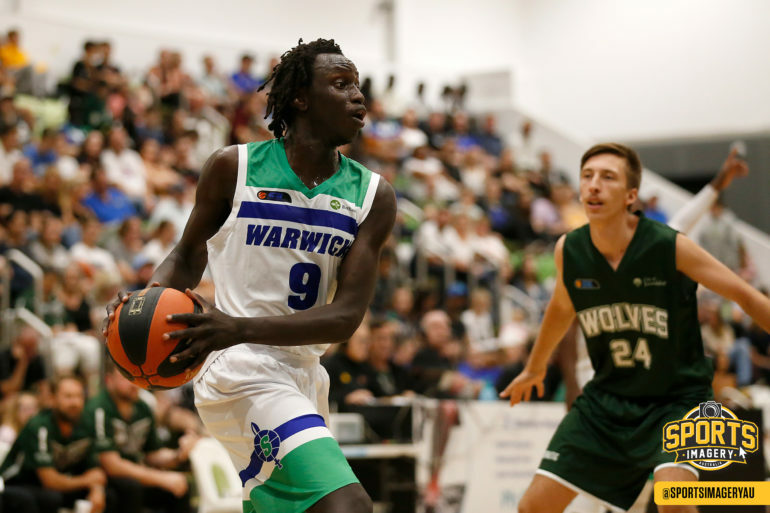 FOR a half on Saturday night the Mandurah Magic looked like they regained their competitive edge but a long and athletic Warwick Senators turned it on in the second half to come away with the 94-63 victory. It was the only appearance of Round 5 in the Men’s SBL for both teams and the Senators couldn’t shake off the Magic in the opening half, leading 40-35 at the major break. But the Senators dominated the second half outscoring the Magic 54 points to 28 to claim the 31-point win to improve to a 3-2 record on the season. Mandurah is now 1-5 and despite starting the season well with two tight losses and then a good win over Kalamunda, the Magic have lost their past three games to East Perth, Perry Lakes and Warwick by a combined 129 points. Mandurah came out determined to respond to their 51 and 47-point losses to the Eagles and Hawks since their win at Kalamunda back in Round 2, but it was never going to be easy against a Warwick team who had showed good signs in the first four weeks and regained import forward Rob Anshila. The Magic did start well and when Travis Durnin knocked down an early three they were up 7-3 and Mike Ellis called an early timeout for Warwick. He didn’t quite get the immediate response but eventually the Senators went in front on a Cody Ellis three-pointer before their ability to play above the rim started coming to the fore with a Ngor Manyang three-point play that capped a 10-0 run. Manyang then added a three-ball from outside the arc and Warwick looked good leading 21-13 by quarter-time. Anshila’s athleticism helped him to two points to start the second quarter and the Senators led by 10 which soon became 12 when the diminutive yet lightning quick Oliver Cross got to the basket. The Magic managed a 7-0 run to close the gap but yet another athletic Warwick move, this time by Wani Swaka Lo Buluk followed by Caleb Davis triple had the home team up by 12 again. But Dylan Moir’s second three of the half kept Mandurah within striking distance before the Magic got back within three. An Ellis turnaround jumper then had Warwick leading 40-35 at the major break. It was a significantly more aggressive Senators outfit that came out after the interval and scored the opening eight points of the second half largely by attacking the basket and capitalising on their length and athleticism. Swaka Lo Buluk continued to enjoy his responsibility carrying the ball and getting to the rack, and he had six points in the opening five minutes of the second half before Anshila had a purple patch with his teammates finding him near the basket where his hops could be used to good effect. The Senators went on to lead 64-51 at three quarter-time and then pulled away further with 30 points to 12 in the fourth term to win by 31 points. Warwick finished the night shooting 35/66 at 53 per cent from the field while collecting 39 rebounds and dishing out 28 assists on those 35 made field goals. They had 18 steals too and forced the Magic into 27 turnovers of which they scored 24 points from. Warwick’s length also came to the fore as they blocked 10 shots on the night. Despite putting up 94 points and winning by 31, it was the evenness of the team performance by the Senators that was most impressive with 11 players scoring, and six of them hitting eight or more points. Caleb Davis top-scored with 15 points, 10 rebounds, four assists and two steals with Wani Swaka Lo Buluk contributing 14 points and six assists, and Ngor Manyang 14 points and five rebounds. Ash Litterick also had 12 points and three rebounds, Cody Ellis eight points, three rebounds and three steals, Rob Anshila eight points, four assists, three blocks, three rebounds and two steals, and Justin King six points, three blocked shots and two assists before his night ended with a concussion. Senators coach Mike Ellis was happy with what he saw especially in the second half. “It was a much better second half. I think in the first half we weren’t doing what we should have been doing, and we spoke about it but we just weren’t executing very well,” Ellis said. “I was a little disappointed with that and we turned the ball over too much especially in the second quarter and gave up too many O-boards, and the problem were that there were some mismatches out there and we get caught up trying to beat the mismatch and forget to actually play. It wasn’t a night without some positives for the Magic. They did collect 18 offensive rebounds and went OK from three-point range shooting it 39 per cent. But ultimately 27 turnovers and only getting to the foul line nine times hurt as did shooting 14/47 from two-point range. Shaun Stewart did have 21 points, seven assists, six rebounds and three steals with Marvin Smith adding 11 points and seven rebounds but the two imports combined for 12 turnovers and just two free-throws. Travis Durnin put up 14 points, six rebounds, three assists and three steals for Mandurah with Dylan Moir impressive with eight points in 16 minutes. Mandurah coach Aaron Trahair looked for positive post-match and felt it was an improvement on the past two losses, but he’d never pretend to be happy with a 31-point loss. “We try to take some positives out of it but still feel like we have a heck of a lot of work to do. We just have to keep chipping away,” Trahair said. After only scoring a combined 121 points in the loss to East Perth and Perry Lakes, Mandurah made a concerted effort to push the ball and be more aggressive on offence. While that might have been a factor in 27 turnovers, at least they were attempting to be a more potent offensive team and Trahair hopes they stick with that moving forward provided their execution improves. “One of the things we really tried to do tonight was get out and push the ball, and try to create some easy offence in transition. That’s something we got away from the last two games and you can see that by the amount of points we scored that we got stuck in a half-court game and really struggled,” Trahair said. “There was a bit of an emphasis to get out and run, and it’s one of those things where you encourage them to run at speed, and their decision-making with that went out the window a little bit. “Having 27 turnovers is obviously way too many to be competitive but looking forward, we just have to keep doing that and putting ourselves in that position to play at speed and make better decisions.